Samaritans began in 1953 at St Stephen Walbrook in London, founded by the then rector Reverend Chad Varah. There are now over 200 branches across the UK and Republic of Ireland. He had been profoundly affected by the impact of suicide since his first day in the ministry, after he conducted the funeral of a 14 year old girl who took her own life believing she had contracted a sexually transmitted disease. In reality the young girl in question had merely started her periods and had no one to turn to. Determined to offer a dedicated service to those suffering with emotional distress or contemplating suicide, Chad began to offer a non-judgemental, safe and confidential listening service to anyone in need in the Crypt at his church St Stephen Walbrook. Throughout his career Chad had offered counselling to his parishioners, and wanted to do something more specific to help people struggling to cope and possibly contemplating suicide. When Chad was offered charge of the parish of St Stephen in the summer of 1953 he knew that the time was right for him to launch what he called a “999 for the suicidal”. He was, in his own words, “a man willing to listen, with a base and an emergency telephone”. 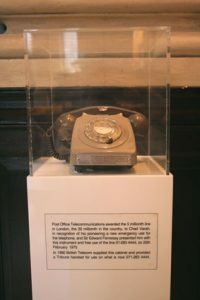 The first call to the new service – the actual telephone is still on display at St Stephen Walbrook – was made on 2nd November 1953 and this date is recognised as Samaritans’ official birthday. Publicity for the London-based service created a lot of interest elsewhere in the UK and as a consequence several more Samaritans centres were set up in the following years – the second being Samaritans in Edinburgh which took its first call on 1st June 1959. There are now 201 branches across the UK and Republic of Ireland. In February 1954, Chad officially handed over the task of supporting the callers to the volunteers, and Samaritans as it is known today was born. Samaritans service today still operates on Chad’s guiding principles of confidential, non-judgmental support. A plaque commemorating the founding of Samaritans was unveiled in 2015 and the original telephone used by Samaritans is on display in the church. This ‘emergency service for the suicidal’ began to gain national newspaper coverage, with the Daily Mirror coining the phrase ‘Good Samaritans’ for the service. This newspaper coverage attracted volunteers, as well as callers, who initially supported Chad by providing tea and coffee and sitting with the callers, offering them someone to chat to while they waited for their appointment. However, it soon became clear that their role was much more central to the service. Often, the clients would pour out their problems to these ‘receptionists’ and many felt no need to speak to Chad afterwards, or intimated that it had been helpful to talk about how they were feeling. Today their Central London branch has around 450 dedicated, compassionate volunteers taking around 100,000 calls for support a year and actively working with high risk groups outside of the branch.